The Redyan Necklace options in A3 Mania have been altered to better suit the Server Gameplay. Regenerates HP and MP of the Character per second. Regeneration Rate in Normal World is 100HP and 50MP. In Proxima, it is 30HP and 15MP. 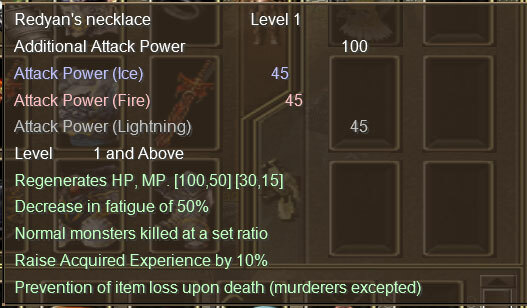 While hunting, the damage done on Normal Monsters is often variable based on your Maximum and Minimum Damage. However, with this option the change of getting a constant attack damange is much higher. Increases base attack power (Strength, Intelligence) by 10% of the current.